The only state flag with a burgee shape, Ohio pays respects to both the United States as a nation and Ohio as it's own state. The use of red, white, and blue is in honor of the U.S. national colors. The red and white stripes represent the roads and waterways, while the blue horizontal triangle represents the Ohio hills and valleys. The "O" is for Ohio, and the red circle in the center symbolizes a buckeye. 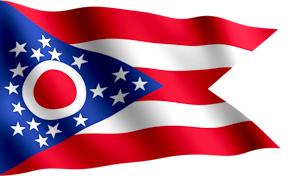 As the 17th state to join the Union, Ohio proudly flies 13 stars for the 13 original colonies. The four stars to the right of the O stand for Ohio being the 4th state after the original 13 to join the Union.